"Pestle" redirects here. For PESTLE, see PEST analysis. 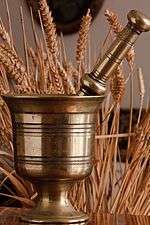 A mortar and pestle is a kitchen device used since ancient times to prepare ingredients or substances by crushing and grinding them into a fine paste or powder. The mortar (/ˈmɔːrtər/) is a bowl, typically made of hard wood, ceramic or stone. The pestle (/ˈpɛsəl/) is a heavy and blunt club-shaped object, the end of which is used for crushing and grinding. The substance to be ground is placed in the mortar and ground, crushed or mixed using a pestle. 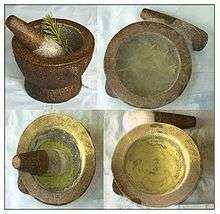 Mortars and pestles have been used in cooking up to the present day; they are frequently also associated with the profession of pharmacy due to their historical use in preparing medicines. They can also be used in masonry and in other types of construction. Scientists have found ancient mortars and pestles that date back to approximately 35,000 B.C. 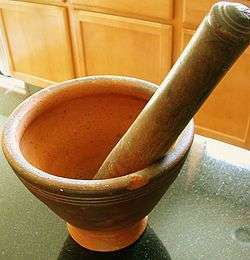 A traditional Indian mortar and pestle. The English word mortar derives from classical Latin mortarium, meaning, among several other usages, "receptacle for pounding" and "product of grinding or pounding". The classical Latin pistillum, meaning "pounder", led to English pestle. The Roman poet Juvenal applied both mortarium and pistillum to articles used in the preparation of drugs, reflecting the early use of the mortar and pestle as a symbol of a pharmacist or apothecary. The antiquity of these tools is well documented in early writing, such as the Egyptian Ebers Papyrus of ~1550 BCE (the oldest preserved piece of medical literature) and the Old Testament (Numbers 11:8 and Proverbs 27:22). Iconic apothecary mortar and pestle, displaying the ℞ symbol for medical prescriptions. Mortars and pestles were traditionally used in pharmacies to crush various ingredients prior to preparing an extemporaneous prescription. The mortar and pestle, with the Rod of Asclepius, the Orange Cross, and others, is one of the most pervasive symbols of pharmacology, along with the show globe. 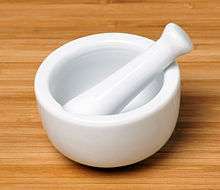 For pharmaceutical use, the mortar and the head of the pestle are usually made of porcelain, while the handle of the pestle is made of wood. This is known as a Wedgwood mortar and pestle and originated in 1759. Today the act of mixing ingredients or reducing the particle size is known as trituration. Mortars and pestles are also used as drug paraphernalia to grind up pills to speed up absorption when they are ingested, or in preparation for insufflation. Mortar used to pulverize plant material. Mortars are also used in cooking to prepare ingredients such as guacamole, gazpacho and pesto (which derives its name from the pestle pounding), as well as grinding spices into powder. The molcajete, a version used by pre-Hispanic Mesoamerican cultures including the Aztec and Maya, stretching back several thousand years, is made of basalt and is used widely in Mexican cooking. Other Native American nations use mortars carved into the bedrock to grind acorns and other nuts. Many such depressions can be found in their territories. In Japan, very large mortars are used with wooden mallets to prepare mochi. A regular sized Japanese mortar and pestle are called a suribachi and surikogi, respectively. Granite mortars and pestles are used in Southeast Asia, as well as Pakistan and India. In India, it is used extensively to make spice mixtures for various delicacies as well as day to day dishes. With the advent of motorized grinders, use of the mortar and pestle has decreased. It is traditional in various Hindu ceremonies (such as weddings, and upanayanam) to crush turmeric in these mortars. Tjobek the Indonesian word in Dutch spelling for mortars and pestles. In Malay, it is known as batu lesung. Large stone mortars, with long (2–3 foot) wood pestles were used in West Asia to grind meat for a type of meatloaf, or kibbeh, as well as the hummus variety known as masabcha. In Indonesia and the Netherlands mortar is known as Cobek or Tjobek and pestle is known as Ulekan or Oelekan. It is often used to make fresh sambal, a spicy chili condiment, hence the sambal ulek/oelek denote its process using pestle. It is also used to ground peanut and other ingredients to make peanut sauce for gado-gado. 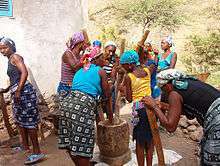 Women in Cape Verde using a large mortar with multiple pestles. Large mortars and pestles are commonly used in developing countries to husk and dehull grain. These are usually made of wood, and operated by one or more people. A Lao‑style mortar and pestle. Mortar and Pestle from bronze alloy, Greece. Good mortar and pestle-making materials must be hard enough to crush the substance rather than be worn away by it. They cannot be too brittle either, or they will break during the pounding and grinding. The material should also be cohesive, so that small bits of the mortar or pestle do not mix in with the ingredients. Smooth and non-porous materials are chosen that will not absorb or trap the substances being ground. In food preparation, a rough or absorbent material may cause the strong flavour of a past ingredient to be tasted in food prepared later. Also, the food particles left in the mortar and on the pestle may support the growth of microorganisms. When dealing with medications, the previously prepared drugs may interact or mix, contaminating the currently used ingredients. Rough ceramic mortar and pestle sets can be used to reduce substances to very fine powders, but stain easily and are brittle. Porcelain mortars are sometimes conditioned for use by grinding some sand to give them a rougher surface which helps to reduce the particle size. Glass mortars and pestles are fragile, but stain-resistant and suitable for use with liquids. However, they do not grind as finely as the ceramic type. Other materials used include marble, stone, wood (highly absorbent), bamboo, iron, steel, brass, and basalt. Mortar and pestle sets made from the wood of old grape vines have proved reliable for grinding salt and pepper at the dinner table. Uncooked rice is sometimes ground in mortars to clean them. This process must be repeated until the rice comes out completely white. 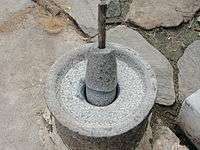 Some stones, such as molcajete, need to be seasoned first before use. Metal mortars are kept lightly oiled. Since the results obtained with hand grinding are neither reproducible nor reliable, most laboratories work with automatic mortar grinders. Grinding time and pressure of the mortar can be adjusted and fixed, saving time and labor. The first automatic Mortar Grinder was invented by F. Kurt Retsch in 1923: the "Retschmill". 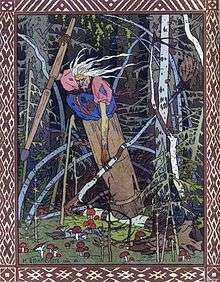 The character Baba Yaga flies while standing in a mortar, and holding a broom in this artwork by Ivan Bilibin. Bangkang Pinawa, ancient Philippines mortar and pestle. In Russian tales, Baba Yagá is portrayed as a hag who flies through the air in a mortar, using the pestle as a rudder. ↑ Pharmaceutical Symbols, Museum of the Royal Pharmaceutical Society of Great Britain. Page 2. Retrieved 2009-10-21. ↑ "The Mortar and Pestle in Thai Cuisine". Temple of Thai. Retrieved 3 December 2016. ↑ "Kitchen Essentials for Southeast Asian Cooking Basic tools and equipment for cooking Southeast Asian food". about food. Section 2. Mortar and Pestle to Make the Best Spice Pastes. Retrieved 3 December 2016. ↑ Retsch: Size reduction with mortar grinders and disc mills. Rose Scientific Ltd. Retrieved 2009-10-21. Wikimedia Commons has media related to Mortars (tools).